This morning the date rolled over to January 1st. Well technically today is March 11th. Oh yeah. It’s also not 1821. But in my current game of Europa Universalis IV (referred to as EUIV and previously written about here), it’s the start of a brand-new day in a still-brand-new century, but it’s also the end of the game. The date rolls over to January 2nd. The end of the game screen pops up, and I feel elated that I saw the game through to completion, but I’m also sad that it’s over. For somebody who still considers themselves an amateur (or maybe a little better than an amateur) I think I did well in the campaign, but there were other things I could’ve done much better. I played this grand campaign as Brandenburg, which in the 1444 start is one of the Prince Electors of the Holy Roman Empire. It’s a landlocked kingdom with three provinces in the northern part of modern-day Germany. 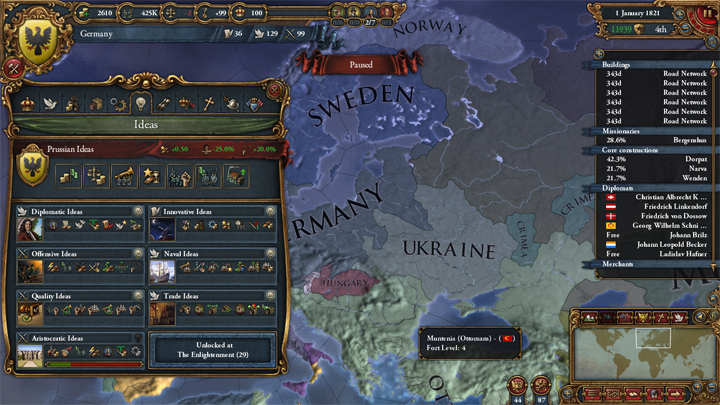 I don’t know if it’s one of the harder starts (the little difficulty meter is at about 75% when you choose Brandenburg), but it’s definitely not the same as playing as England, Castille, France, or even Austria. 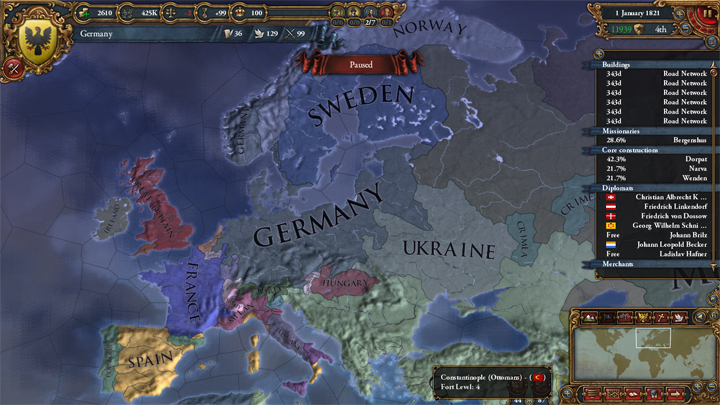 In a previous attempt at Brandenburg, I tried to create the Kingdom of Prussia. It went terribly. Oh, I created the kingdom, but it fell apart due to religious turmoil and two concurrent wars with most of Northern and Western Europe. This time, I said to myself, we’re going to create Germany instead. We’re going to be smarter. The game started, and I made many of the same moves. I allied myself with Austria, which in 1444 is the older brother in the HRE family. 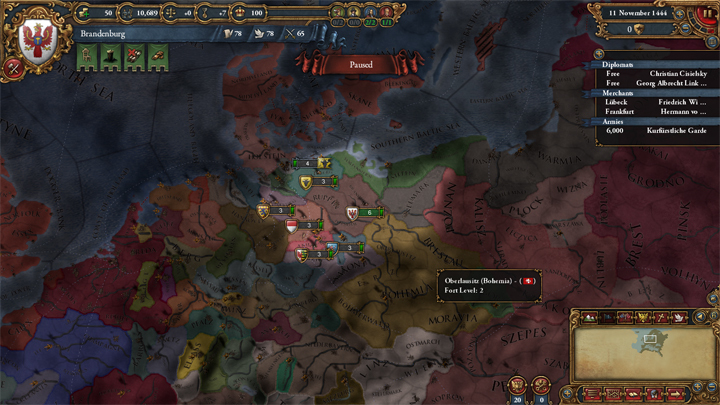 Getting them and their 30,000+ troops on my side helped me in my early conquests of Mecklenburg and the like. 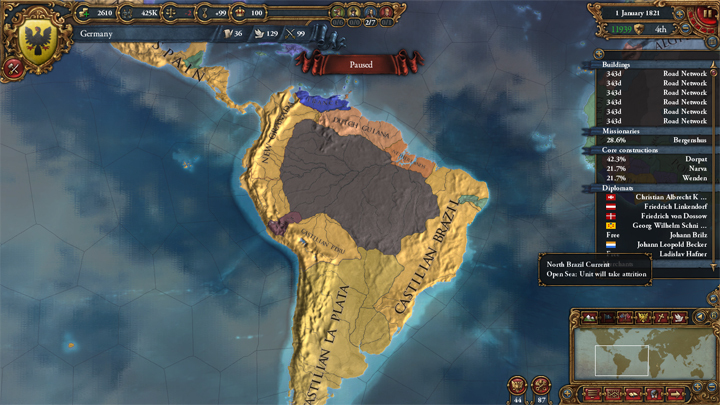 What I didn’t account for–couldn’t have even known–was that Paradox changed how the AI reacts to the player’s aggressive expansion. I conquered two places before the 1470s and instantly all my neighbors were in a coalition against me. And then the next thing I knew I was fighting for my life as they declared a “punitive war” against me. 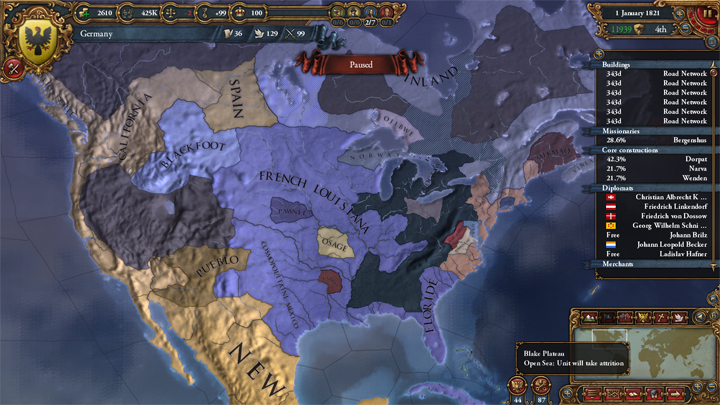 Thankfully, some help from my allies (which I don’t know if it included France at this point) and a huge infusion of cash via loans saw me through the troubled coalition times. Even though I won the wars, from then on I was constantly behind the 8-ball with coalitions and most my neighbors having “outraged” opinions of me. Playing as part of the Holy Roman Empire adds a whole other batch of concerns that other countries don’t have to deal with. You’re part of a loose confederation of states (kingdoms, duchies, bishoprics, etc.) that elect an emperor. Brandenburg is one of the electors, and I spent a chunk of time trying to get the other electors to vote for me. While it was useful being the Emperor in the mid 1500s, most of the states were too outraged at me for me to enact any of the possible reforms. I became the Emperor as Brandenburg, and then kept that title as I transitioned to Germany. I annexed a few of the electors, which I’m not sure was a mistake or not. If I was trying to get through the list of Imperial Reforms, then it definitely was. However since my goal was to create Germany and then dominate central Europe (colonization was not part of my agenda), I decided that annexing territory was more important than keeping all the electors happy with me. Besides, as the Emperor I was able to create new ones. My choices–Savoy, Mantua, and Milan–were huge mistakes. From what I saw during this playthrough, even though Savoy had +200 opinion of me, I was the current Emperor, and I was the largest country the HRE, they still voted for themselves. Same for Manuta, and then Milan supported them. I lost my throne to Mantua–a two or three province kingdom in modern day Northern Italy. They ended up holding onto the throne for a few hundred years until Milan conquered them and somehow I was elected again (though I swear I only had 2 votes at the time). Since I didn’t care about colonization, I decided I needed to win the trade war in Central Europe to fund my expansions. To do that, I needed to control the Lubeck trade node. So Denmark became enemy number 1. It took more wars than I thought–my original plan was to conquer a few provinces and then in a later war vassalize them. For whatever reason, even with only 2 provinces remaining, the cost to vassalize Denmark was too high. So I conquered them. Bye bye, Denmark. At the same time, I turned on my old ally Poland. 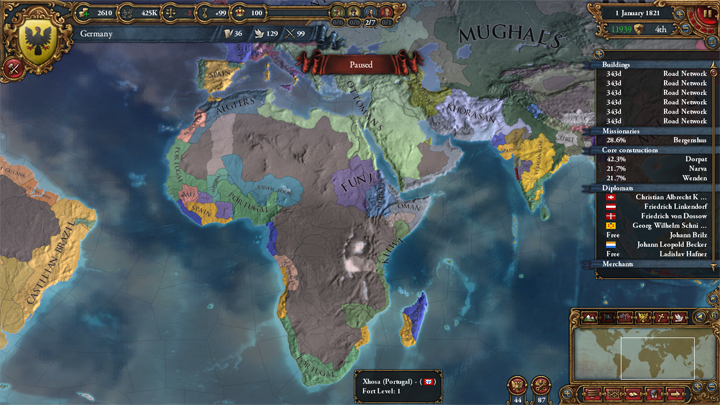 Thanks to the tweaked mechanics, because I was allied with France, Poland decided they had too many “Great Power Alliances.” They broke ties with me, and over the next several hundred years, their territory shrank dramatically. They used to control the corridor from the Baltic to Marmara; by 1821 I had eaten up all their northern territory (which included Lithuania, the Teutonic Order, and the Livonian Order), while Crimea, Ukraine, and then the Ottomans devoured their southern portion. By the 1700s and onward, I was basically unstoppable. I didn’t lose a single war I fought. France, Ireland (independent and with colonies! ), and then even Great Britain became my allies. Because I was dominating trade in several nodes, and I wasn’t wasting money and resources colonizing overseas, I was able to hire all level 3 advisors, fight wars, and continue to build almost every single province improvement while continuing to make 100+ ducats a month. Thanks to my idea groups and buildings, I ended up with over 450K in manpower and land force limits above 350. By 1821 I had the second largest army in the entire world, and not even mighty Russia could stand up to me. In the last 2 years of the game, I took four provinces from Russia without using even half my army. Enacting an Imperial Reform that outlaws all internal HRE wars just because you can is stupid. Especially when you want to finish off Austria, Lorraine, and the Netherlands. Austria got the Burgundian Inheritance but lost most of their territory to France, the Netherlands, and Lorraine. I freed Styria from Austria in the 1500s, and it grew to be one of the more powerful HRE member states. It even ate up all of Switzerland. Never, ever make Savoy part of the electorate. Ireland stayed independent the whole time! They even colonized parts of North America. Both Norway and Sweden broke free from their personal unions with Denmark. Norway took most of Sweden until I gave them their cores back as part of the spoils of war. Peasant Wars are not fun. By the end of the game everybody just gets ahead of time when it comes to military tech. The USA declared independence in 1791 as a kingdom. They later switched to the Federal Republic government type. However, they only had 1 province the entire time. I never once fought the Ottomans. I really wish I had dismantled the HRE. Maybe these numbers are not impressive at all when compared to the entire pool of EUIV players, but overall, this was a great experience. Now, what country should I play next?